Reasons to choose wood look luxury vinyl tile. Great floor option for kitchen or bathroom remodels. Durable flooring option for kids and families. We were fortunate enough to uncover beautiful hardwood floors throughout most of our house. It’s the first thing people comment on when they come in our home! But there was one section of our home where the flooring wasn’t so nice…it was actually pretty terrible. Our kitchen and small bathroom area flooring was disgusting! It had some gross carpet (I mean, who puts carpet in the kitchen and the bathroom?) and it had been badly damaged over years. We had to completely rip out the flooring in the bathroom, but the flooring in the kitchen was able to act as a sub floor for what we chose to put on top. 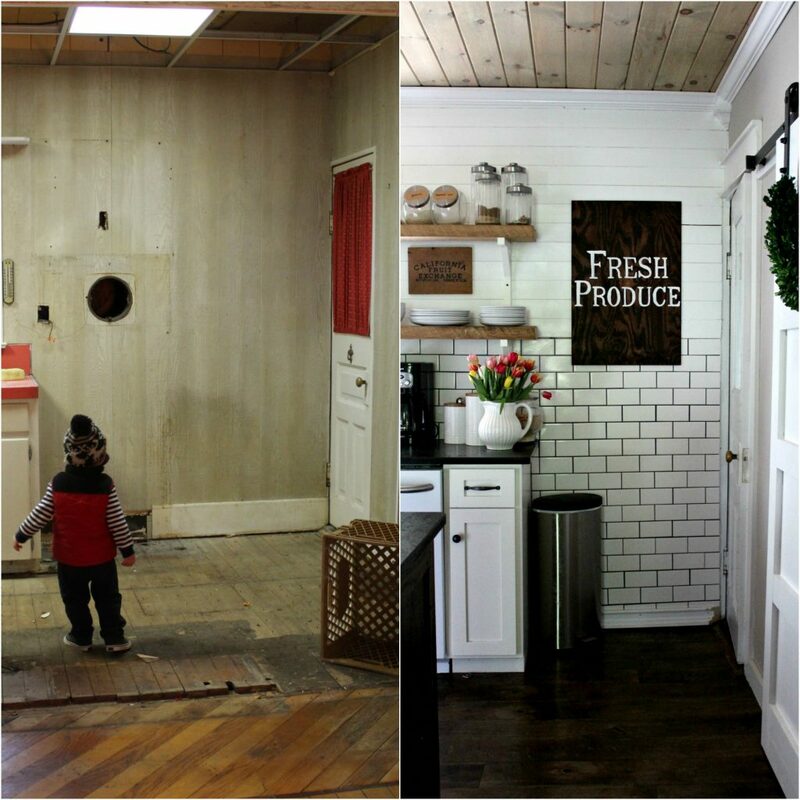 We originally researched flooring options when we did our first kitchen remodel. We knew we wanted something that was durable, looked great, would stand up to spills and moisture, and would last a long time. When we went to our local flooring store, they told us the best fit would be luxury vinyl tile. I honestly had never heard of it before! 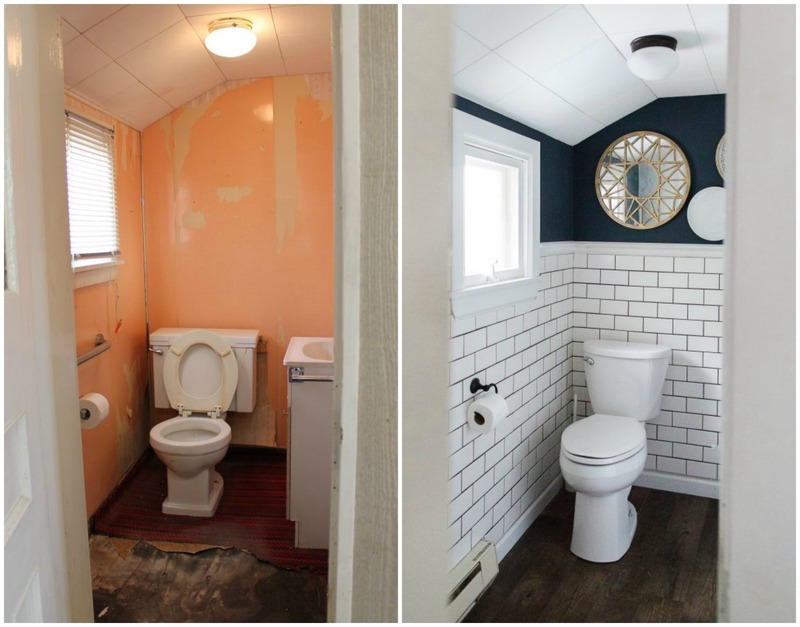 I imagined it to look like traditional tile – and that’s not the look I wanted. But when I saw their samples, it didn’t look like tile at all. Luxury vinyl tile can come in all kinds of styles, but we chose a wood-look style. 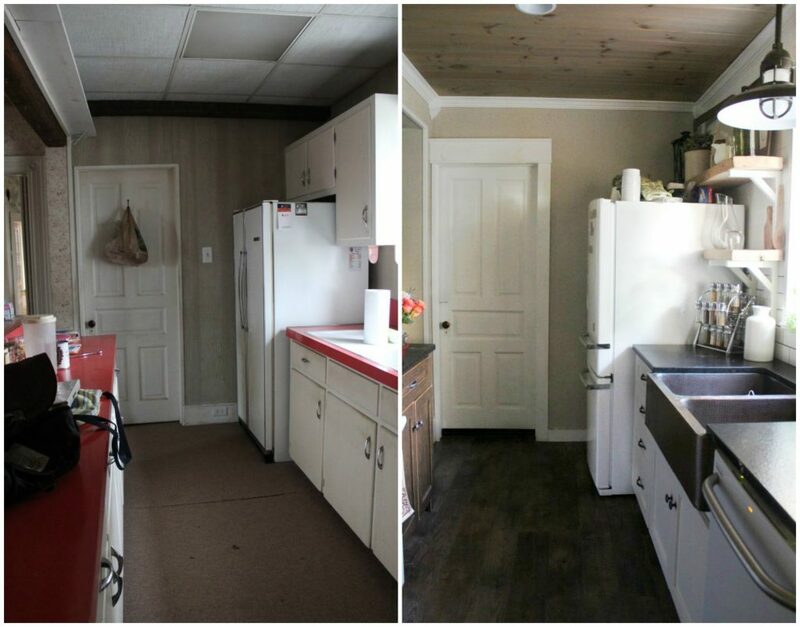 We loved how the flooring looked and held up in our first kitchen (pictured above – finished pictures here) so when we realized we needed to find flooring for our current kitchen and bathroom, we chose the exact same luxury vinyl tile flooring. We’re planning to remodel our master bathroom in the next year, and we’re planning on using the same flooring for that room as well! I have the EXACT brand/name of luxury vinyl tile in this post here – click to read and see the manufacturer label. 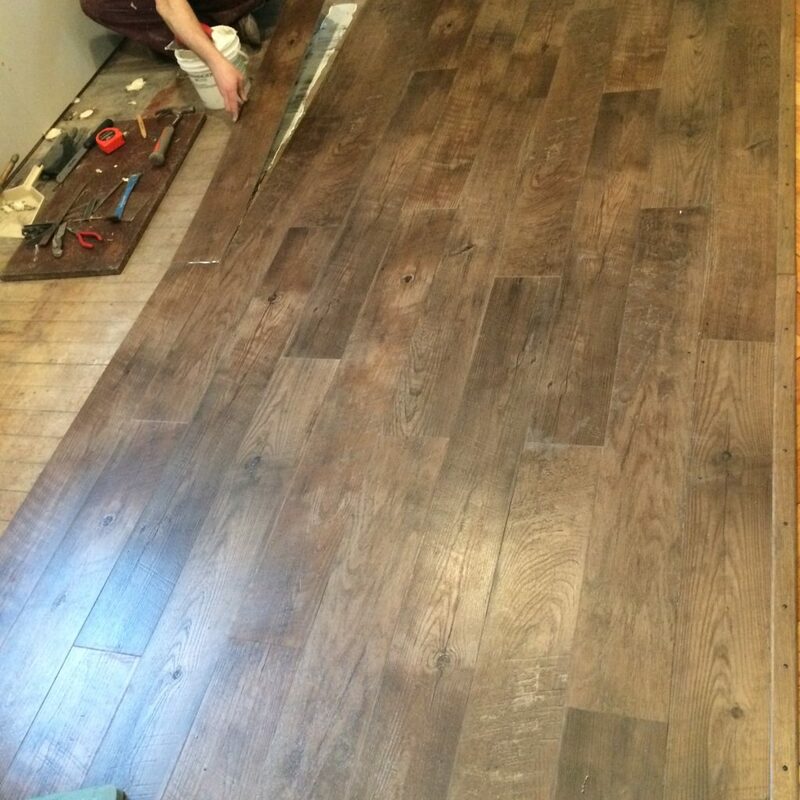 With a toddler who loves to drag his wood stool on our floors, and a 1 year old who literally tries to carve holes into the floor with forks while I’m making dinner…we needed durable flooring! We haven’t had any issues with scratches or dents in our luxury vinyl tile – and even if we got some, it’s engineered to look authentically old so it would just add to the look. Once people get into our kitchen, they often ask us about our flooring. It’s unique and works so well with our farmhouse decor. People have actually asked if they’re original to the house! I love the rustic wood look – and the color is perfect. It would honestly fit seamlessly with many different kinds of decor – it works well in our farmhouse kitchen, but it wouldn’t just have to stay with that design style. 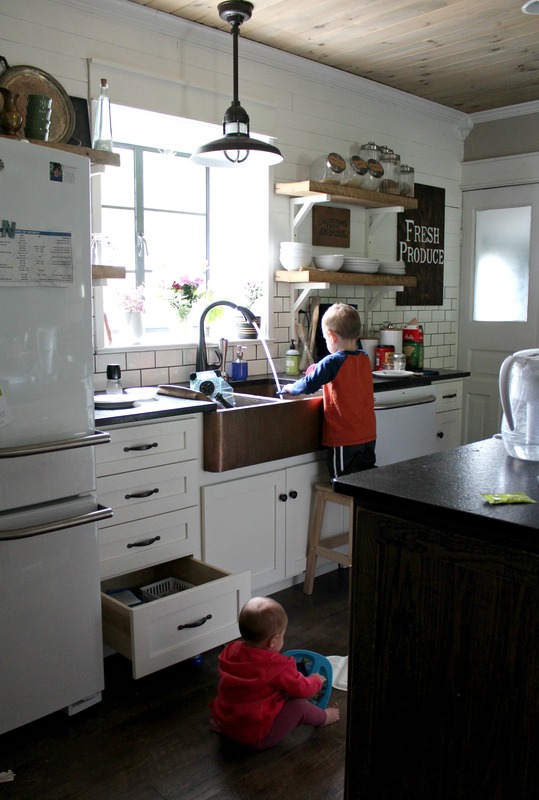 There’s definitely no shortage of spills in our kitchen with two little kids! That was one of the major selling points for us when we bought our flooring. It’s so much better for these high-trafficked and high-spill areas of our house than our hardwood floors. Luxury vinyl tile is a really good option for bathrooms too – it stands up to moisture really well and cleans up nicely. As mentioned above – we’re choosing it again when we remodel our bathroom upstairs for that very reason! We’ve had our flooring for a few years without signs of wear or damage, but it’s so important to choose a flooring company that will stand behind their products. Have you used luxury vinyl tile in your home? If not, where would you like to use it? What style/color of the Floorte flooring did you use? It looks beautiful! In the beginning stages of a reno & looking into luxury vinyl plank tile floors too! Love the color floors you have, what color is it? Did you grout the tile in either the bathroom or kitchen? Wow these floors really look great! 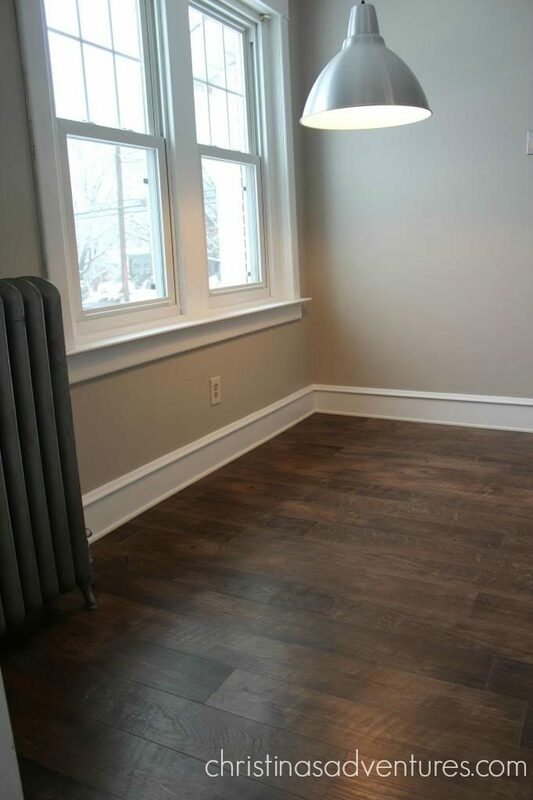 We have hardwoods throughout our renovated house except the bathrooms and kitchen. We replaced the bathrooms with wood look tile but are contemplating the luxury vinyl for the kitchen especially since they look fantastic. Your floors look great! I am a big fan of LVP as you can have a “wood floor” anywhere you want. After researching many different brands I chose the FirmFit brand, rigid vinyl plank and had it installed in my entire new house as I wanted a “wood look” floor that was durable and realistic in appearance. This floor is a floating type with a heavy duty click together installation and requires no acclimation. It is waterproof. resistant to extreme temperature changes and will not gap, swell, buckle or come apart. It can even be used in sunrooms (many vinyl floors advise you to pull curtains in sunny rooms to prevent problems!). It can also be used in installations of up to 6700 square feet with no transition strips. Since I have a very open floor plan, this was a plus. This plank (6″ x 48″) has a rigid core comprised of about 65% limestone dust with a textured, heavy duty wood grain vinyl wear layer and comes in many very realistic wood grain pattern/species, with micro beveled edges on all sides of the plank. It has a lifetime guarantee for residential use and can also be used commercially. I chose the Topaz line (premium) in the color/design called LAREDO. It is a medium dark color with an old, distressed look and very subtle color variations much like your flooring. My whole interior (except for the bath which is painted Sherwin Williams Anew Grey) is SW Snowbound in eggshell finish. The grey color in the bath sets off all the white in cabinets, woodwork and subway tile which has grey grout to match (same tile and grout was used in the kitchen back splash). Being able to use the same flooring throughout the entire house combined with the ease of maintenance, the realistic look and feel of the floor (as you said, no one knows it is not wood unless you tell them) and the durability and price price was a no-brainer. The many wood looks available across the board in LVP are amazing. This is definitely not our grandmother’s vinyl floor. In obsessed with the style (color and grain)! Where did you buy it from and what style/comoany/model number?! Thank you!! !